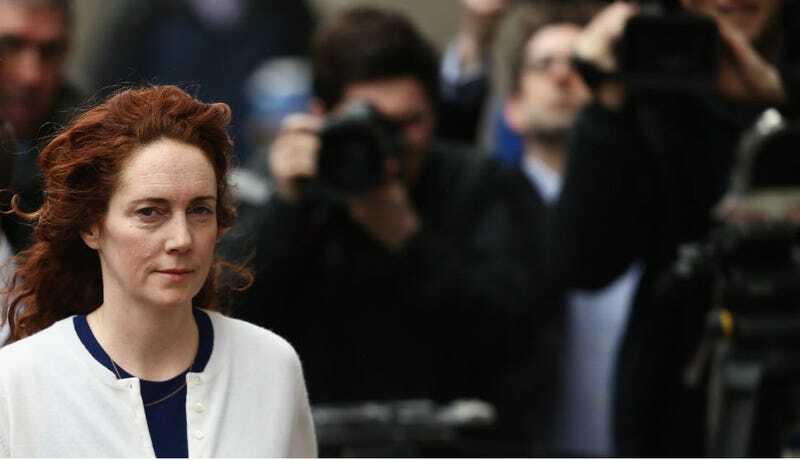 Rebekah Brooks, the former News of the World editor currently on trial in London, was acquitted Wednesday of one count of conspiracy to commit misconduct in public office. The jury in the phone-hacking trial have been directed to find Rebekah Brooks "not guilty" in relation to a charge that she unlawfully [authorized] payment to a public official for a photograph of Prince William in fancy dress. They were ordered to do so by Mr Justice Saunders just before Brooks opened her [defense] on Thursday morning at the Old Bailey phone hacking trial. He told jurors there was "no case to answer" in relation to count 4, one of the five counts against Brooks. "There is no case to answer for Mrs Brooks … that's the charge relating to the picture of Prince William in a bikini that was acquired by the Sun," said Saunders. Saunders told the jury that he had made the decision as "a matter of law" and then told them to enter a not guilty verdict. "It's for you to bring in a verdict of not guilty on that count now," he said. She has pleaded not guilty to all charges which also include a conspiracy to hack phones and two charges alleging she obstructed the police investigating phone hacking by conspiring with her secretary and her husband, Charlie, to conceal material from Scotland Yard detectives. The hacking trial, which includes six other defendants, has been going on since October.